Pandy's of Lake Sunapee: Third Time is a Charm! I tried a green bathing suit..my son picked out some bright lime green fabric. First try....pattern directions were wrong. Went in the trash. Tried a second time with blue fabric. Don't ever use clear swimsuit elastic. You will want to strangle yourself with it. That one is a little odd, but he can wear it okay. I sure can't sell it, though! Third try....came out pretty well, I'd say!!!!!! 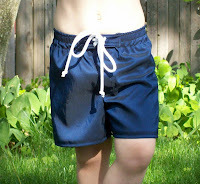 I just got sick of bathing suits for little boys that were covered in skulls, or were board short length....looked like capris on a little boy.